Really. A camel. 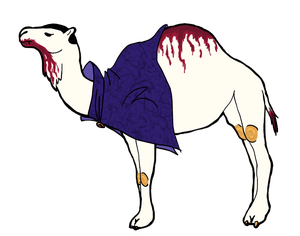 Vampire camel. Smart vampire camel. Now imagine a herd of them. I can also draw a commission of your OC, please visit my Commission Info! They say it can go without blood for three weeks at a time! It can... But what for? Well... how much prey is he going to find in the vast desert? I just draw this creature in a desert cause it was just a funny sketch. So it is, thank you! I wasnt saying anything bad about it!